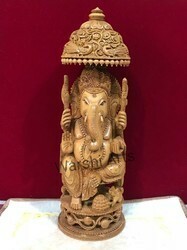 We are a leading 100% Export Oriented Unit of wooden chattar ganesh statue, wooden ganesh statue, sandalwood chattar shape ganesh, sandalwood open shape ganesh and sandalwood undercut chattar ganesh from Jaipur, India. 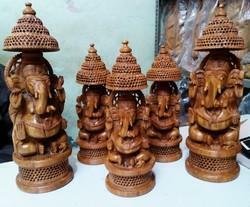 Wooden Ganesh Statue is one of the wooden handicrafts product. This wooden ganesh made by white kadam wood. 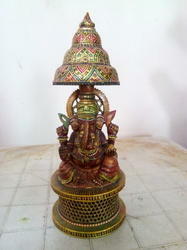 we are provide wooden ganesh various design and fine work. We have to many type work in wooden ganesh. like carving worked and figures worked from and back both side . we are provide to our client most competitive. This Sandalwood Chattar Shape Ganesh is one of the wooden handicrafts product. This product is made by white wood and Sandal wood. 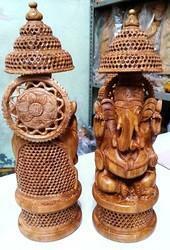 Sandal wood Ganesh is made by master crafts men in Rajasthan. This god statues is used to home, office and gift purpose. All size available in various design with good work. We are provide to our client to most reasonable price. This Sandal wood Ganesha like name is Sandal wood ganesha , Wooden Ganesha, Sandal wood god statues, Sandal wood religious statues and more. 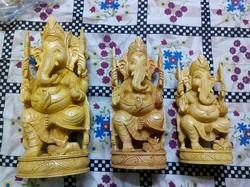 We have many type wooden handicrafts in White wood & sandal wood. Packaging Details: Carefully packaing in bubbles paper . Sandalwood Open Shape Ganesh is traditional used for temple, house mandir and gift purpose. This wooden ganesh is made by white wood. All size is available in according to order base. We have provide to our client this good most competitive price. Our firm is counted amongst the significant names, offering a wide range of excellent quality Sandalwood Undercut Chattar Ganesh. Our range is designed using excellent quality raw material with unique patterns, as per defined widely approved industry parameters. Moreover, our offered statue is highly demanded in the market, owing to its features like an immaculate finish, attractive design and long-lasting shine. Apart from all this, clients' can avail this statue from us at industry leading prices.